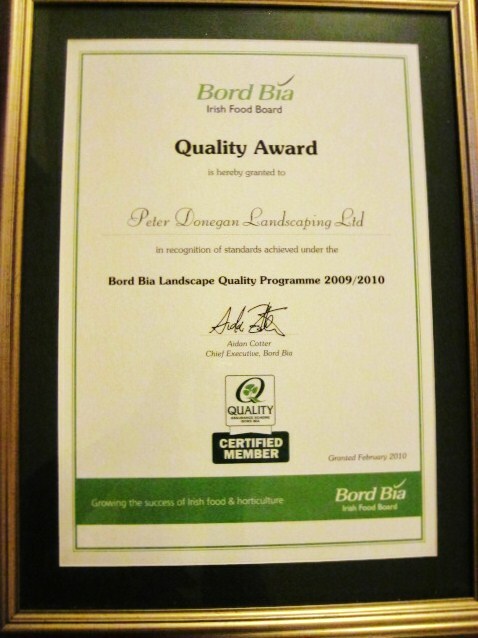 Peter Donegan Landscaping Ltd has achieved the Bord Bia Quality Award. The assessment for this award is through a stringently audited programme that was designed to raise standards within the landscape industry and increase customer confidence by rewarding companies who operate an awarded quality system through best practice and at the highest standards possible to this sector of the horticultural industry. In 2009 the Landscape Quality Award had only been achieved by eight companies in Ireland. There are two award levels on both programmes; a Certificate of Merit (60% score) and the Quality Award (75% score). This is my third consecutive year to accept the Quality Award. I am delighted to win this award. I am now starting my 10th year in business and this now is recognition that a quality system is in place behind the scenes as well an already proven ability to design and landscape. Well done you! The hard work has paid off! Congratulations! A third one? –wow that’s fantastic news. Congrats! Thats a really great achievement, and great recognition. thank you, thank you agus go raibh míle maith agaibh faoi sin. Congrats. You get these every year anyway!